August 15, 2008. Legendary Music Producer Jerry Wexler has passed away at his home in Florida at the age of 91. Wexler's death was attributed to several years of a deteriorating heart disease. Wexler who was formerly Senior VP with Atlantic Records and later associated with Warner Brothers Records, was a giant among the industry artists with whom he helped develop. Joining Atlantic in 1953 after a stint as a journalist with Billboard Magazine, Wexler was responsible for helping shape the future of the music business by changing the name of music coming from black artists formerly known as "Race Music" and then changed it to the modern day term of "Rhythm and Blues." A young Jerry Wexler helped build the Atlantic label from a small R&B label to the musical empire that exists today. Legendary artists like Ray Charles, Wilson Pickett, Percy Sledge and other greats including the "Queen of Soul" herself, Aretha Franklin, were early notches in Wexler's career belt. Wexler, who had made the transition from journalist and turned record producer, was also involved in the daily mechanics of the company's powerful promotion department. Teamed with the late Ahmet Ertegun, this dynamic duo came to be known both jointly and individually as the greatest record executives on the planet. In the early days Jerry Wexler was ahead of his time and wired to the timely trends of Southern music while being responsible for several key distribution deals such as the one with Memphis based STAX Records. Both companies benefited greatly from this agreement and paved the way for many Soul artists to reach stardom. 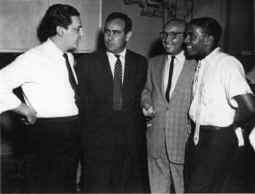 (L-R) Jerry Wexler, Jim Stewart, Bob Kornhauser, Juggy Gales, Solomon Burke, unidentified and Johnny Beinstock. Later distribution deals soon flourished as Atlantic would ink successful agreements with Capricorn Records, Chimneyville Records and Alston Records that would literally put those companies on the musical map. 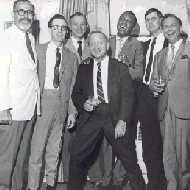 In this photo Wexler is second from left with Ertegun standing right of him. Modern trends hit the music business in the late 1960's and early 70's as Wexler began to weave his magic into Chips Moman's American Studio in Memphis, Rick Hall's Fame Recording Studio and Barry Beckett's studio in Muscle Shoals, Alabama. Upon that recognition, Pop Music soon became a priority when Atlantic artists Dusty Springfield, Herbie Mann, Donny Hathaway, Danny O'Keefe, Delaney & Bonnie Bramlett, Duane Allman, Boz Skaggs, Doug Sahm, Cher and New Orleans favorite Dr. John, all with the help of Jerry Wexler helped redefine Southern Music. Soon Wexler was off to his next location of Criteria Recording Studio in Miami where many Atlantic artists would record; The Bee Gees, Black Oak Arkansas and Derek & The Dominos to name a few. Wexler's next move was one that many saw as a losing cause while others viewed as train wreck in the making. That's when Wexler opened an office in Nashville, TN and signed country artist, Willie Nelson. It was now official, as the label that helped develop and bring to the forefront...Soul Music, Jazz Music, Pop Music and Heavy Metal, had now entered the Country and Western music arena with Willie Nelson's new album, "Phases and Stages." Yet, a short period later as lean sales would prevail, Willie Nelson would depart the label and sign a long term contract with Columbia Records. That's when Atlantic folded it's tent and closed it's Nashville operations. During the same period, there was much transpiring in Wexler's life. Here's a capsule of events that weren't quite so rosy for Wexler. By now, David Geffen had entered the picture and made life miserable for Wex. The two had disagreements over business issues and guess who got the upper hand? That's when Jerry Wexler moved to Miami. During that cycle there were many significant changes within the music business as Wexler would respond to the markets' shift in consumer buying habits by saying "The longhairs are taking over the business." In short, the popularity of R&B singles had taken a back seat in sales and this genre was indeed Wexler's baby. Plus, to add misery to this decline, Wexler's marriage of many years had gone sour and he ended-up getting a divorce during that time. Back in New York, Ahmet Ertegun had re-asserted his executive power at the home office after Wexler's departure and developed a new regime of company officers that were keen to the recent marketing shifts. However, believe it or not, Wexler soon moved back to the Big Apple but by that time things had changed and Wexler's authoritative pulse just wasn't the same. Editors note: As the author of this posting, I wanted to publish something on the day of Jerry Wexler's passing. I was kinda prepared yet somehow unprepared for his death. Reason being, Wexler didn't show up at the recent Atlantic Records Employee Reunion in Las Vegas. We were told that he didn't travel any more. Ahmet Ertegun made a speech at the party and read a personal note sent from Jerry Wexler that touched the souls of everyone in attendance. Be that as it may, when summarizing Wexler's career for this posting, I realized that it would take a month-of-Sundays just to capture his entire body of work. I'm sure that I probably left-out much about his brilliant career (Bob Dylan, Dire Straits, Linda Ronstadt). Please forgive me but somehow a man like Jerry Wexler just can't be epitomized in a single posting. Also, please note that I didn't share any of my stories from personal experiences with Jerry Wexler. After all, I worked for Atlantic and lived both in Memphis and Miami during a time of enormous growth and prosperity for the company and witnessed many of the changes unfold. Yet, that sequence of time also began a period of moderate decline for Wexler's influence. But on this sacred day of his passing, none of that is important. By all accounts, my faires can't even touch the surface of this industry legend. But please do me a favor, considering your interest in Jerry Wexler by the viewing of this posting, please obtain a copy of his book ""Rhythm & the Blues." Much of what I've omitted from this transcript was for a specific reason. Wexler's candid stories are very interesting reading and reveals much about his journey through the history of recorded music. RIP Jerry Wexler. Travel well my friend.